Pamela's winning Almost Kiss excerpt was full of sparks and surprises. We received positive reader response for this spunky romance. "Great tension! I was riveted to every word!" "Love the anticipation and butterflies in the almost kiss scene..."
"The setting was marvelous, the tension leaped off the pages." 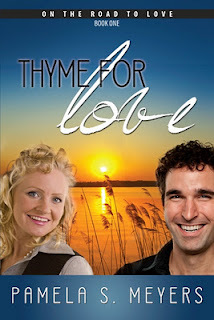 A Thyme for Love is a wonderful example of the awesome Christian fiction available. This week, an exciting new Unpublished Novel Clash begins. It's hosted by our very own April Gardner! Make sure you come by for another chance to vote and WIN a free book!